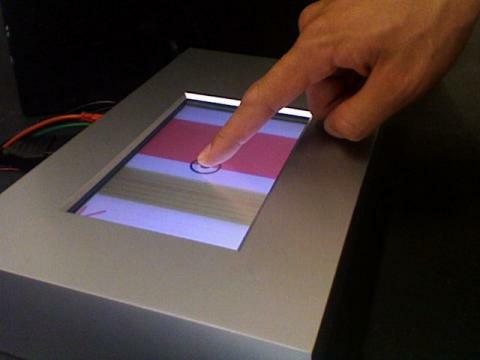 Finger operated touch-screen interfaces are being used in many places like information kiosks, point-of-sale systems, automation systems and even mobile phones. The operation of these devices is very intuitive as they can be operated directly with one or several fingers. But they all have one big deficiency: no matter what interface element you touch, you touch the same unresponsive glass. It's like trying to feel the world around you through very thick gloves. And this despite the fact that humans have a very developed sense of touch. Imagine flicking through the pages of a book without feeling them go through your fingers. Imagine writing with a pencil without feeling its surface friction. Imagine brushing your teeth without feeling how hard you press and whether you are actually touching your teeth or your gums. If you think of all the occasions you are «seeing through touching», you'll be surprised how many there are – and you don't even notice them consciously! With my thesis I want to identify useful applications for touch-feedback technology in touch-screen interactions. To achieve this goal I will build a prototype display and program several sample applications that illustrate possible usecases.